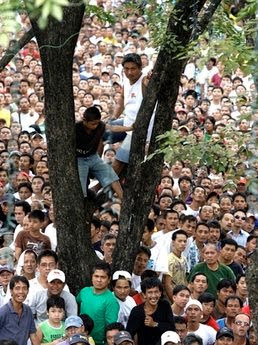 This is a picture of avid boxing fans in the Philippines. As far as I can remember, boxing has always been a popular sport back home. I still remember 'Thrilla in Manila" although I didn't watch it. I remember our neighbors getting together so they could watch it as a group. Navarette was the name that used to come to mind whenever I think of Filipino boxers. He used to be famous but it was a brief one. Today, Manny Pacquiao is synonymous to 'boxing' back there [and everywhere, maybe?]. Why not when he's been setting world record after world record just like what he did when he beat his latest opponent yesterday. According to the news, crimes come to a halt whenever he has a fight. One can only wish....if he can fight daily. Of course that's not possible. After this latest victory, I wonder if he will return to the ring again. A Mayweather bout is what's everybody's waiting for. But is it worth it? Anyway...I don't watch boxing. I'm happy he won but I just can't watch a sport where blood is a sure thing. But that's just me. So you're not a boxing fan pala, ha J? Everyone here is glued on screens whether in movie houses, restos, open grounds or anywhere that shows Pacquiao's fight. The world comes into a halt every time Pacquiao is on the ring. We were lucky to watch it live in the resort we were in yesterday.Exciting! Pacquiao definitely doesn't need Gayweather, err.. Mayweather. Next time nood ka na! Lol! We just had a wonderful weekend. I hope you had too! bulaga din hahaha. ako din, hindi boxing fanatic. si F, he really wants to see the Mayweather -Pacquaio fight if it ever happens. sabi niya, kahit sa Pinas daw ang laban dadayuin daw niya hahaha. weather's been nice kahit mahangin. I'd take it over icy and bitter cold temps. sana tahimik ang Miyerkoles ninyo.